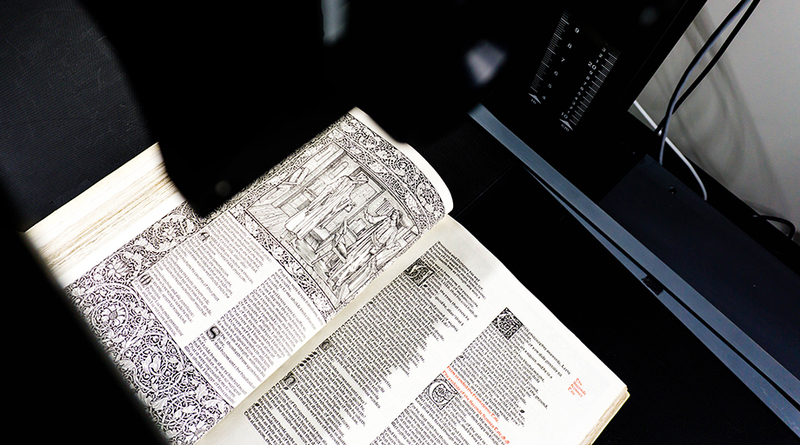 When UBC Library acquired the Kelmscott Press’ Works of Geoffrey Chaucer in August 2016, the announcement marked the successful end of a long journey to bring the book to UBC, but the book’s preservation story was just beginning. Printed by William Morris’ Kelmscott Press in 1896, as part of a limited run of 438 copies, the book took Morris four years to design, thanks to the many elaborate illustrations and decorative borders that populate its pages. Now as one of UBC’s most valuable holdings at Rare Books and Special Collections (RBSC), the book is an incredible resource for researchers and students with an interest in historic literature and the art of book design. For UBC’s Digital Initiatives team, it was important to preserve the beauty bound in the book’s pages in a digital format to create even wider access. Digitizing the Kelmscott Chaucer was challenging because the book is tightly bound and has small gutters (the blank spaces surrounding a book’s type area). A scanner with a top-notch digital camera back was used to capture the intricate detailing on each page. With the digitization complete, the book is now available to read online, as a treasured addition to UBC Library’s Open Collections. To celebrate the occasion, UBC Library has created a free digital colouring book, featuring 25 beautiful illustrations from Kelmscott’s Chaucer. Download your copy of UBC Library’s Kelmscott Chaucer Digital Colouring Book and check out more photos from the digitizing process on Flickr.